I'm trying to install HAXM for Android Studio on macOS 10.13. I went to the 'Security & Privacy' panel in order to allow the software to run, but I've run into an issue. No matter how many times I press 'Allow', nothing seems to happen. The message and button remain... I've even rebooted. It's still there. 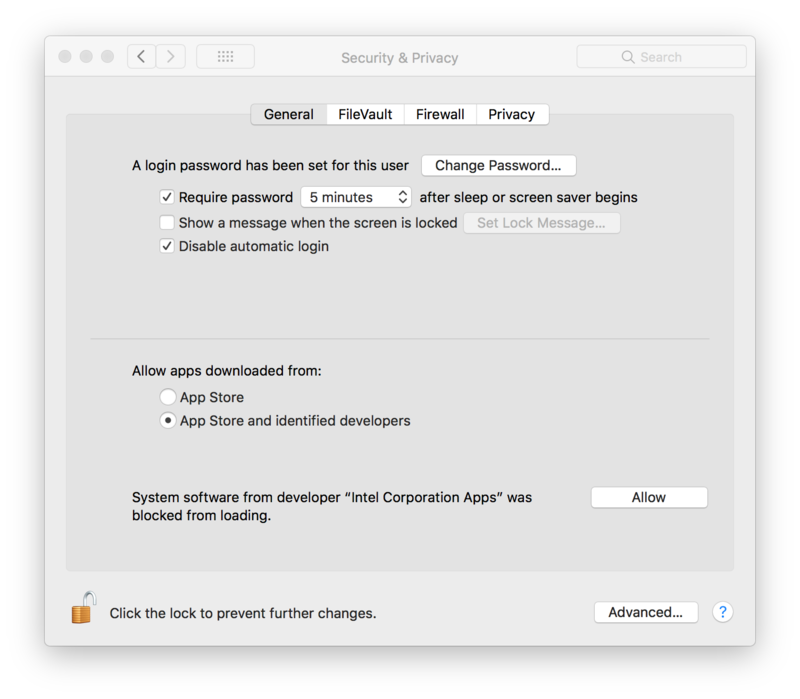 This is a new feature in macOS High Sierra that blocks kernel extensions from 3rd-party developers until manually allowed via the Security & Privacy preferences pane. Note this is different from Gatekeeper — this blocks signed kexts until you allow them, and all unsigned kexts are blocked unless System Integrity Protection is disabled. Gatekeeper blocks unsigned apps from running until you allow them. Apple has some further details in TN2459: User-Approved Kernel Extension Loading. According to reports such as this issue thread for Karabiner, programs that might be intercepting or simulating mouse clicks such as MagicPrefs or VNC could be at fault. If you can temporarily disable those programs, and be in front of the machine rather than connected remotely via Screen Sharing or similar, it will work. As a more complex workaround, you can disable System Integrity Protection for kexts with csrutil enable --without kext, then reboot to the regular OS and ensure the Android emulator is working, then (optionally but recommended) reboot to Recovery Mode again and re-enable SIP with csrutil enable. This will automatically add all installed signed 3rd-party kexts to the whitelist. I had this issue with both Google Drive and Karabiner elements not being allowed to load. I closed quit Chrome and the Allow button worked. I would expect an Intel product to be signed and therefore authorized by Apple. Hope this works in High Sierra, this trick works on Sierra. Had this same issue - thought it was because of the trackpad somehow not being recognised as a mouse and nothing. Updated keyboard shortcuts and was unable to 'tab' past the hard break in the option field. after about 30 google searches and a whole bunch of trial and error... the answer in the end was simple. Not the answer you're looking for? Browse other questions tagged macos high-sierra android . How to run Xcode 6 on macOS High Sierra(10.13)? “An error occurred installing macOS” in VMware?